Does a larger 165mm main driver improve this floorstander? Reassuringly familiar - even with its bigger 165mm driver, the Avant 914i offers good value for money and looks the part while doing so. While the top end is a little exposed and the upper bass and lower mid a bit lacking, the midrange shines brightly. Operating alongside electronics brands like Cambridge Audio, Mordaunt-Short has been an integral part of Audio Partnership for a number of years. Audio Partnership was one of the first hi-fi companies to appreciate the advantages of combining UK design talent with low Chinese manufacturing costs, accumulating a reassuring amount of experience working alongside its Chinese partners. There's always a sense of deja vu when a new Mordaunt-Short Avant speaker arrives. We've reviewed a number of examples since the 900-series was first introduced around the Millennium, and all look as though they could have hatched from the same pod. The original 900 evolved into the Avant 900, and is now the Avant 900i. The overwhelming majority are based on 135mm main drivers, but more recently a larger 165mm driver has started to appear, initially in the 914, and now in this 914i, and its larger 916i brother. All models share very similar and attractively sharp styling on the outside, and the core ingredients inside have also undergone steady refinement. In terms of pricing, this £300 per pair Avant 914i sits halfway between the two-way 904i and the two-and-a-half-way 906i. Like the 904i, it's a simple two-way design, but has a larger main driver and enclosure. Available in either black, calvados or maple woodprint, part of the enclosure is blanked off near the base, allowing mass loading/damping material to be added. An aluminium 'skin' covers the upper front section, matching the alloy drive unit diaphragms. The main driver has a 120mm diameter dish-shaped diaphragm, described as a Continuous Profile Cone (CPC), which is reinforced by small radial ribs just in from the edge. The tweeter has a mesh-protected 25mm metal dome. Signal is applied to stylish twin terminal pairs, and moulded 'outrigger' feet improve mechanical stability. We couldn't match Mordaunt-Short's claim for 90dB sensitivity here - 88dB looks closer to the mark using our far-field in-room averaged technique. However, that's still a respectable enough figure in view of the ingredients, relatively easy load, and good bass extension. The overall frequency balance isn't all that smooth, but remains pretty well ordered overall. Output is a little lean through the upper bass and lower mid; dips are visible around 600Hz and 5kHz; and the treble looks a little exposed. The impedance traces reveal a modest pair-matching discrepancy at low frequencies. The ports are tuned to 40/43Hz, and the load stays above six ohms across the band, albeit dipping to around four ohms at around 12kHz. Under in-room conditions, the bass shows decent extension down to around 25Hz. The 914i is a thoroughly competent design that disguises its inevitable limitations pretty well. 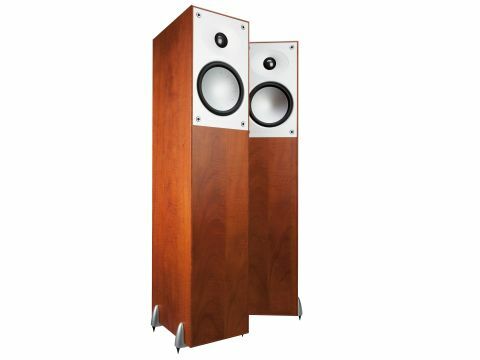 Box colorations are notably well controlled, and if dynamic expression is hardly dramatic, it does seem to offer a significant improvement over the Avant models using the smaller 135mm drivers. Imaging is very good in terms of lateral positioning, though the modest degree of transparency somewhat inhibits depth perception and precision. Midband colorations seem pretty well controlled, but because consonants are slightly weak, speech does sound a little 'shut in', and intelligibility is slightly affected in consequence. The midband is where these speakers shine brightest, as the performance tails off somewhat towards the top and bottom ends of the audio band. The top end is not particularly sweet, and it's also a little too exposed, so it does draw rather too much attention to itself. Systems with an inherently bright balance will not make an ideal match. The bottom end isn't too strong, but it does sound a trifle detached, perhaps because some lack of warmth and punch in the upper bass and lower midband.